Roger Ryan wrote: There's a world of difference between a timed theatrical print and rushes printed haphazardly for quick reference or to use in a work-print. Yes but you should see the Caligari examples. My understanding is that, for CALIGARI, they used actual theatrical prints to fill in the gaps not covered by the existing original negative. For ONCE UPON A TIME... the "restored" footage came from rushes, material printed for reference only and not color-timed for theatrical release. While I hesitate to compare two films shot sixty-odd years apart, a print created for theatrical presentation is usually better-looking than footage printed to use in a work-print or for quick reference. I haven't seen the restorations of either film properly (I've seen CALIGARI on-line), but I'm not sure they are comparable. One would hope that the original camera negative would exist for all of footage shot for a film merely thirty years old and it's disappointing that this material doesn't exist. However, it's a real surprise that most of the original camera negative exists for a film shot 95 years ago and I'm very pleased that CALIGARI looks magnificent. Maybe Leone wrote a note on his deathbed saying: "GREEN! GREEN! BATHE EVERYTHING IN GREEN!" 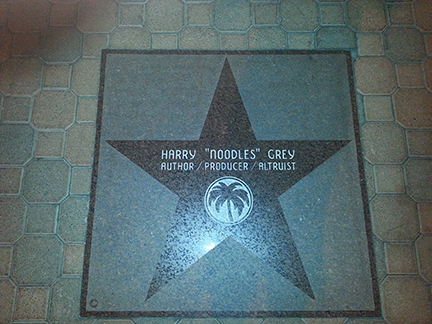 a question: the award credits harry gray as a producer. is this a credit from the film or something else, and if so, what? One of the things that struck me now was just how great De Niro is--here more noticeably so than in some of his other very fine work--at balancing the different passages of time with tiny details that you don't notice in isolation but when taken as a whole you see just how great his overall performance is. The scenes with the older Noodles is shocking to watch today--for all intents and purposes, you might think you are watching newly shot footage featuring the 2015 version of De Niro if you didn't know better. The ever so slightly heaviness and and stiffness that now comes natural to the movements of the 72 year old De Niro of today is foreshadowed by the De Niro 30+ years in the past. Out of all the actors playing the "older" versions of themselves in the film, De Niro was the only one who literally BECOMES an old man. This really is a great film BECAUSE of its messiness of narrative and contradictions. It's simultaneously beautiful and ugly, crude and sophisticated, ham-fisted and subtle. It has weird off-tone digressions almost every 3rd or 4th scene and can go from tense drama featuring only a few glances and movements to pure childish slapstick at the drop of a dime. There are scenes that are almost too ugly to watch at times (as discussed in detail in the past pages in this thread) and scenes that are more beautiful and affecting than anything I've seen in any other Leone film. I think the final discussion between Noodles and Max at the party is right up there with Paris, Texas' "phone scene" as one of the most heartbreaking scenes put on celluloid. Yet despite all the weird contradictions and unevenness and just plain ugliness, when you take it in as a whole, it really stays with you long after it's over. I was going to pick this up, but held off because of the comments on the quality. Surprised to see the 2-disc edition is now selling for $200 on Amazon. Is it simply out of stock @ Amazon, out of print, or is WB working on improving the release? Fox got all the Regency titles from Warner so that's why it is oop. I think they have plans for a single disc edition but haven't heard about them re releasing the 2 disc one. The Fox reissue is out and it is a two-disc version. I couldn't find any comparisons online, are the WB 2-disc & Fox reissue identical? I put an order in for the Fox release anyway so if nobody has anything I can try and post some matching screencaps to what's already out there of the WB release when I get it. Alright, I'm not an expert or anything so I'm unsure if this could be caused by a different method of screencapping or something, but the Fox release does seem to have a VERY slightly different color tone though a functionally identical transfer otherwise, going off the caps on Blu-ray.com and capsaholic. Are the audio and subtitles the same or different on the Fox disc? Yeah, it looks like it's the same stuff going off the info available online in comparison to what's on the disc. In looking back at it now it appears that the Warner Video logo actually appears when the disc is put in so it might actually be the same exact disc; the differences seen above could just be because my way of screencapping is somehow wrong. The bitrate/file size is the exact same down to the byte. Watched this film for the first time last night and ultimately I have mixed feelings about it. I will say it's clearly a well-made masterpiece. I felt drawn in and interested in the story right from the get-go. Despite the nearly 4-hour runtime I never felt bored and was constantly engrossed. I also want to praise that my expectations of the film were never met, and Leone deserves credit for clearly telling the story he wants to tell. Despite casting and an opening scene that might lead one to believe this film would be about De Neiro being some "ultimate gangster" type, he's actually the opposite. He comes off as a soft, bruised soul, that in reality is never quite on the same page as his business partner and best friend. Looking back on the film, I can really see how the overarching message, and not just one or two examples, point to it as an indictment of American capitalism. De Neiro represents the idea that capitalism, if restrained and respectful, could work for all. But Woods' character shows the underlying greed that will always prevail in power struggles related to this economic system. He'd prefer to have everything for himself, even if that means his best friend has nothing. Even if it means he must abandon his previous life. So where does the film let me down? I think I can just enjoy a film. Some films don't need to be "overthought" and they can be fun and be engrossing and keep you interested--just tell a story well. That's what this film does for a good portion of its run time. But the ending does the opposite. Maybe I should have felt, as soon as we learn Woods is alive (which was pretty obvious given the burnt face in the opening scene) that this was some grand betrayal. But I never felt that way, and I don't think De Neiro's character makes the audience feel anything other than, "Hmm, that's interesting." The excited feeling in your gut that some of the other best scenes in the movie give you...a certain excitement, is totally absent at the end. I look forward to revisiting the film. It does a great job of playing into and breaking down the biggest gangster film tropes. But the ending didn't do it for me.